This belt looks familiar. I know Geoff Ogilvy sports this trendy belt. I live in Portland, OR, where Puma clothes, shoes, etc. are the uniforms of the urban kids. They make shoes that are distinctive because they look like bowling shoes or wrestling shoes. Plus, they are very colorful. Of course the leaping Puma Cat is a dead giveaway as well. 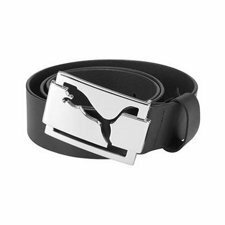 The big belt buckles are the fad on the PGA Tour these days, and this trendy Puma Golf High Shine Belt will match your Puma golf shoes nicely. The belt is made of genuine leather with a heavy metal buckle with a glossy finish. I must admit, the cut-out cat design is very cool! However, I'm pretty sure I don't want to wear a huge belt buckle while I'm playing golf. I know, I'm not in style, but I like to be loose and unencumbered when I'm swinging the golf club, and this heavy piece of metal feels cumbersome and awkward. I prefer Nike Golf Tiger Woods belts. They are sportier, and the belt buckle is less bulky. Check out the Nike Golf Tiger Woods Men's G-Flex Oil Tan Leather Belt. It's a sharp-looking belt, plus it has the G-Flex Technology which makes the belt more flexible. This is important to me when I'm letting "The Big Dog Eat." ...And the big dog is going to eat your bulky leaping Puma cat.